Dining Table No. 1 has arrived in its new home. I was enormously nervous while delivering this table, I was unsure of how stable the table would be but was very pleasantly surprised to find I could actually sit on the outer edge of the glass without the table so much as budging. Relief. The current piece of glass is from the clients old dining table, they plan on purchasing a longer piece of glass that may have some shape to it. I will professional photograph it once the real top has arrived. With the white oak slats twisted into shape and drying it was time to layout exactly where each slat was going to attach to the frame and drill holes in the steel frame for where the fasteners would go. It took a few tries to get the spacing right with the dividers, a centreline was scribed and the holes were set with a punch and hammer. The steel base was clamped down to the bed and using a jig that held the drill parallel to the bed 198 holes were drilled through the 3/16" thick steel. 37.25" of lineal steel were drilled through over the course of two days. As the 66 wood slats got fit into place the same drill jig was used to drill out the wood slats for the fasteners. Dining Table No. 1 is going to consist of 66 twisted wood slats twisted to 16 different angles. We are using 3/4" thick kiln dried white oak that will be steamed at 200+ degrees fahrenheit for around 2 hours. Here is a video of the twisting in action. Clamps, we also needed a lot of clamps, seriously. Incorporating metal into my furniture is something I have a growing interest in as of late. It opens new doors for pushing the boundaries of traditional construction and forms. Below is a sketch of a dining table commission, it will at some point be a metal frame that will house 66 twisted wood slats in the weeks to come. Stay tuned for updates of the process and headaches that will surely follow. First post on the new blog, allow me to introduce myself, my name is Reed Hansuld and I design / build custom furniture. I plan on using this blog as a place to spotlight the process of making my ideas reality. Enjoy! 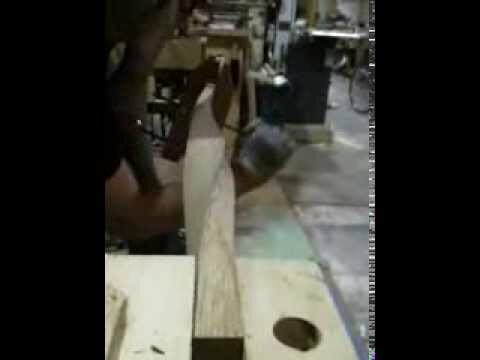 I am going to start with a video we shot last week of a kiln dried white oak blank being steam twisted. Dimensions are approximately 3/4" x 2" x 34". We were steaming and twisting 60+ blanks over the weekend in preparation for a dining table that will be constructed over the next couple weeks. Stay tuned for updates of the process.